The first named storm of the year has formed in the western Caribbean, a full week before the Atlantic Hurricane Season officially begins on June 1st. 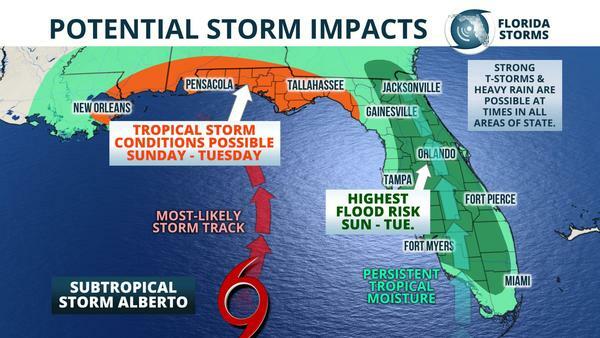 Subtropical Storm Alberto could produce tropical storm force winds, minor storm surge, and inland flooding along portions of the Florida Gulf Coast Sunday and Monday. Locations near Pensacola to Panama City are most likely to experience these conditions, but the potential hazards from this storm also include coastal regions as far south as Naples. As of the 11 am advisory from the National Hurricane Center, Sub-Tropical Storm Alberto was located 60 miles south of Cozumel, Mexico. Maximum sustained winds were only near 40 mph, but they extended 115 miles from the center. 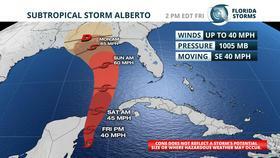 Alberto is slowly moving north and is expected to reach the Gulf of Mexico by Saturday night. Environmental conditions are conducive for Alberto to strengthen into a formidable tropical storm as it slowly drifts into the southeastern Gulf. By Monday, it is forecast to make a turn to the northwest and approach the north-central Gulf Coast where it could make landfall Monday night. For most Floridians, heavy rain and potential flooding is still the greatest hazard associated with this storm. Since Alberto is expected to slow down as it makes landfall, the heavy rain risk could last well into next week, creating the potential for flash flooding and river flooding. In addition, a damaging wind and tornado risk will also be prevalent across mainly inland areas each afternoon and evening where strong thunderstorms develop. Subtropical Storm Alberto's moisture and resulting downpours may linger over the state through much of next week, further aggravating the flooding risk. However, other tropical weather hazards such as surge, wind and coastal flooding should subside by Tuesday.